Just the other day...I had a moment with God that I will not soon forget. I had a few minutes to myself and decided to relax for a bit on our hammock outside. The sky was bright blue, there was a warm wind blowing, and all was right with the world. What I can hide from others, I cannot hide from my Father. He knew the stark truth of my condition. I was hurting. A relaxing moment wasn't my true need. What I truly needed was a conversation with Him! Lovingly, He spoke to my heart and the tears that rolled off my cheeks felt like a cleansing. He was so specific that it nearly took my breath away. Moments like that change everything. The sting of hurt was removed in an instant. He showed me in the Word what He had already proven to me...that He had taken note of my pain. He had rushed to my side. I, like the psalmist, rejoiced in His love! He is not far off and removed! He is not distant and uncaring. He is near...nearer than you can imagine. If it concerns you -- it concerns Him! You are His child! He loves you. He has not given up on you, nor has He thrown in the towel and proclaimed "hopeless" over your life! NO...it's quite the opposite!! He is ready to meet with you and speak truth, life, healing, wisdom, and love. Don't worry! 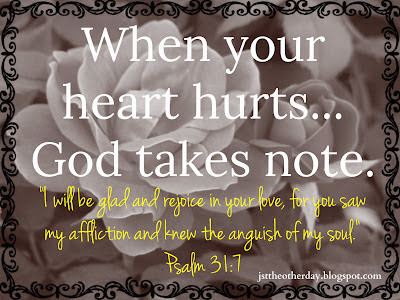 He has already taken note of your pain. Will you get alone with Him?